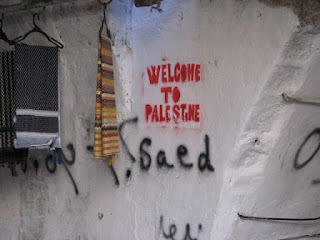 This is the West Bank in Israel. The sign says it all! 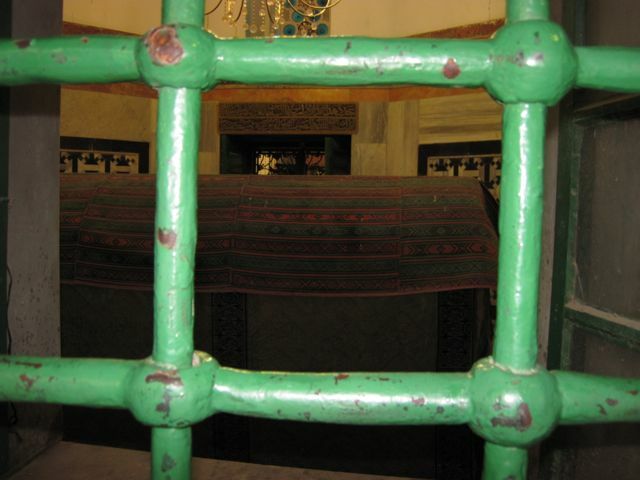 This is Abraham's tomb from the Palestinian side. 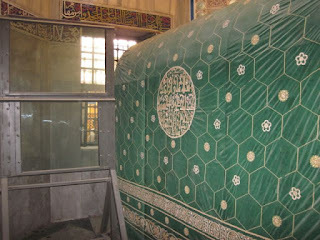 That is bullet proof glass on the left of the tomb that shields the Israeli side of the tomb from the Muslim side. No-man's land next to the Tomb of the Patriarchs in Hebron. The right side of the barrier is where the Palestinians can walk, watched by the Israeli guards of course. On the left side of the barrier the Israeli's can walk. But no one really walks much in this area because it is a war zone. This is Abraham's tomb from the Israeli side. It is heavily secured as you can see. 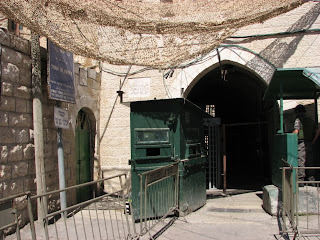 An Israeli guard house at the Tomb of the Patriarchs in Hebron. Captain Steve standing before Abraham's tomb. 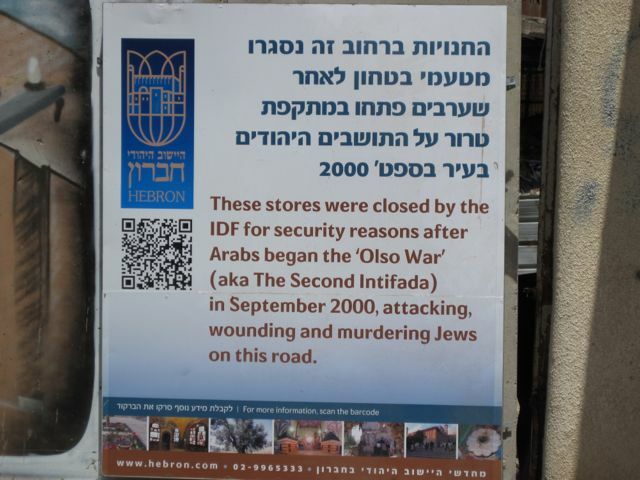 This is an example of one of the signs in Hebron. 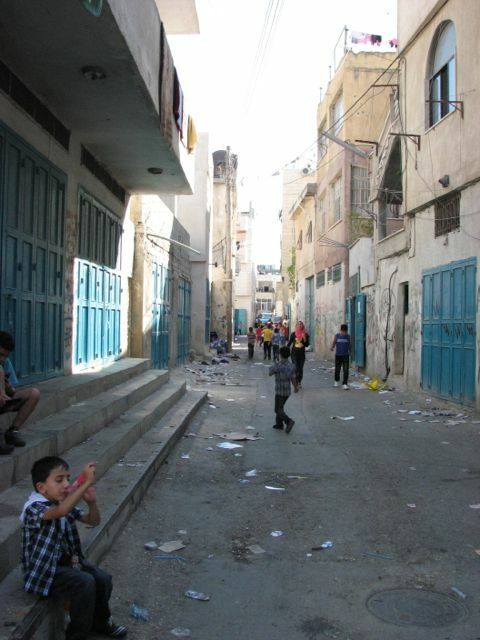 Most of the center of the old town is abandoned and similar to a ghost town except for the Israeli Army patrolling the streets. Lunch time with an Israeli family in their home with Maria on the left. We had upside down chicken and rice and a vegetable. No McDonalds here! 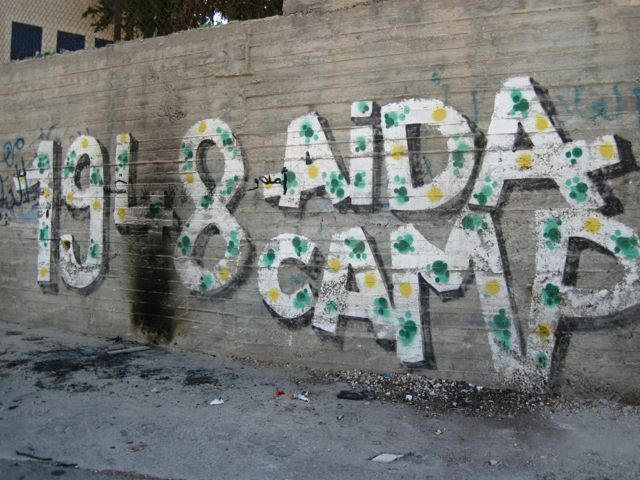 Aida Camp is a Palestinian refugee camp on the edge of Bethlehem. We walked around inside of the camp. 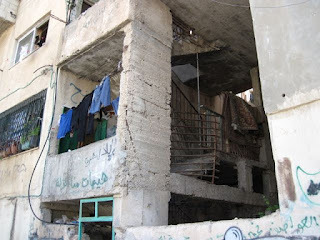 This is the inside of the Palestinian refugee camp. It makes us appreciate what we have. 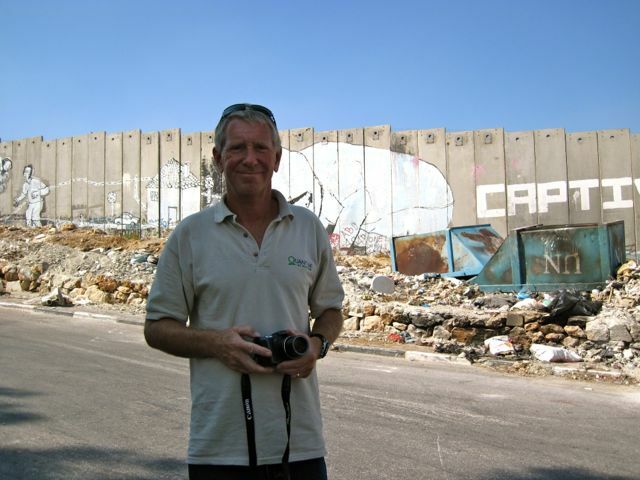 This is the Wall that Israel is building between Israel and Palestine. It was supposed to be about 5 miles long but it is currently 10 miles long and growing longer every day. You can see the UN dumpsters in the background, next to the graffiti. This is another part of the Wall. The pictures explain the Palestinian side of the story. Another view of the Palestinian refugee camp with the closed and locked stores. 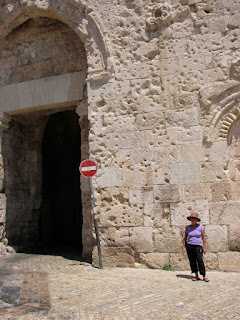 Entrance to the Church of the Nativity in Bethlehem. We entered through the "door of humility" to gain access to the church. 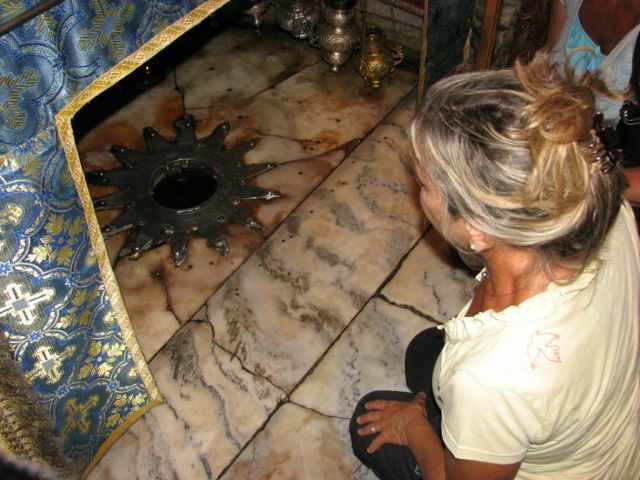 Maria in awe at the birthplace of Jesus, marked by the star. 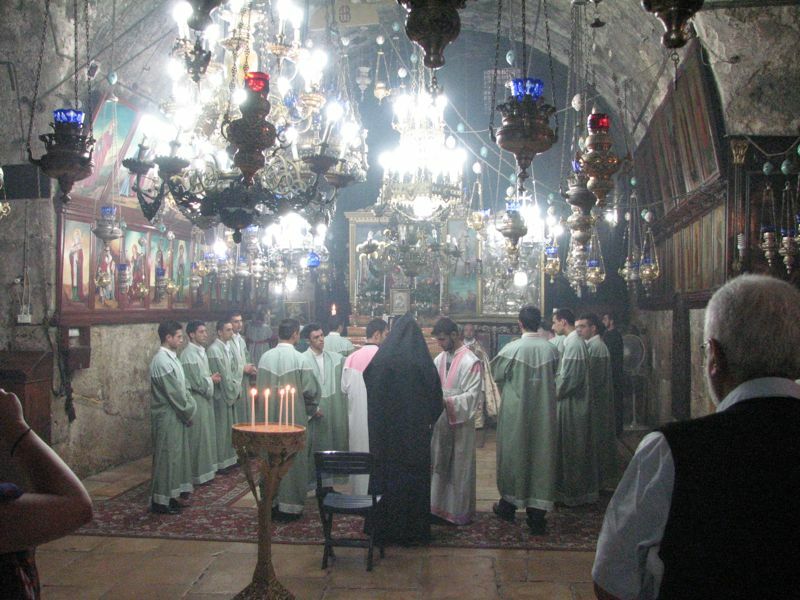 Another view of the Church of the Nativity in Bethlehem. The view of the countryside around Bethlehem from the Church of the Nativity. It is very arid and barren today as you can see. 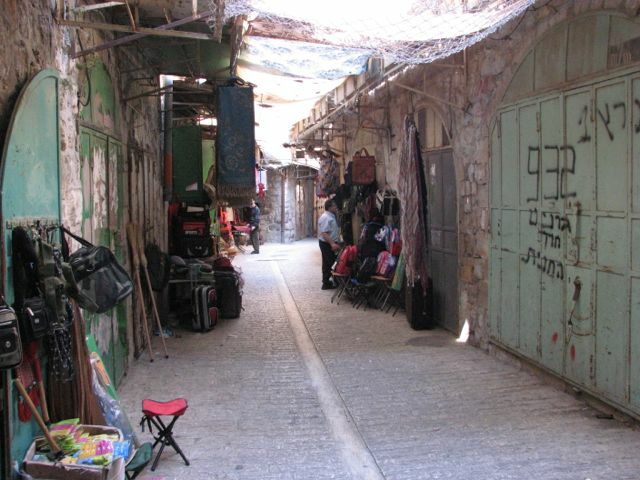 The old city of Hebron. Most of the shops have been locked and shuttered by the Israeli Army. Look at the netting over the alleyway. This prevents being hit by objects that are thrown by the settlers from above. It doesn't stop liquids however. Some of the larger objects caught in the netting. 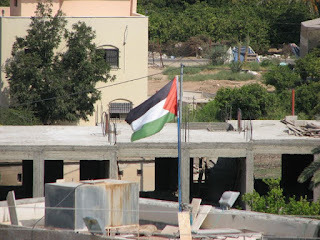 One of the many well defined areas in the West Bank. Some of the gates, walls and checkpoints at the Tomb of the Patriarchs. 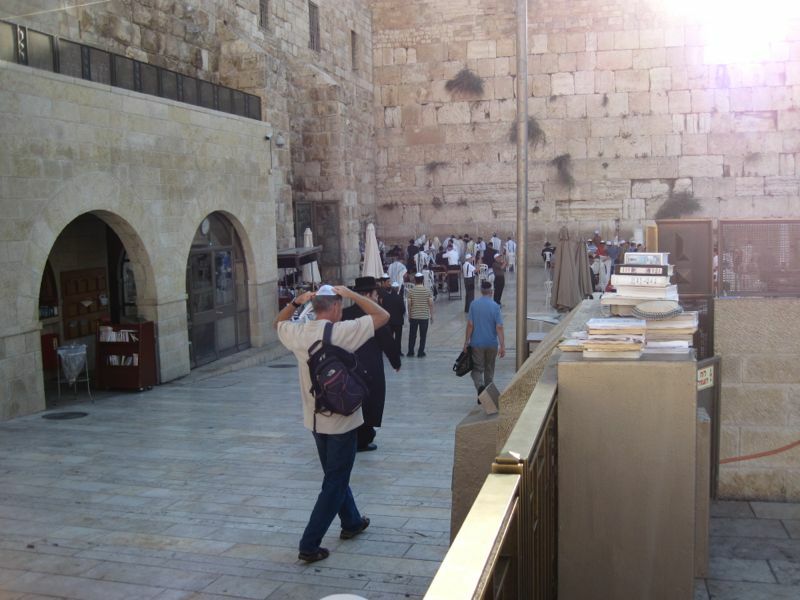 That is a heavily armed Israeli soldier walking on the top of the wall. 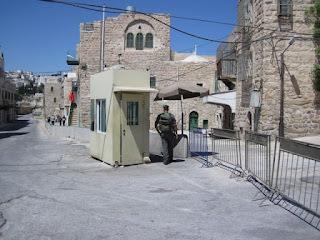 Another military checkpoint we had to go through to get into the Palestinian side of the Tomb of the Patriarchs. Maria inside the Palestinian side of the Tomb of the Patriarchs. She was required to wear the robe because this was the Muslim side of the tomb. Ah yes, the footprint of Adam! THE Adam from Adam and Eve. Maria seems to be enjoying wearing this stylish robe. No, this isn’t your ordinary bank but THE West Bank in Israel occupied mostly by the Palestinians but under Israeli control with new Jewish settlers arriving every day. 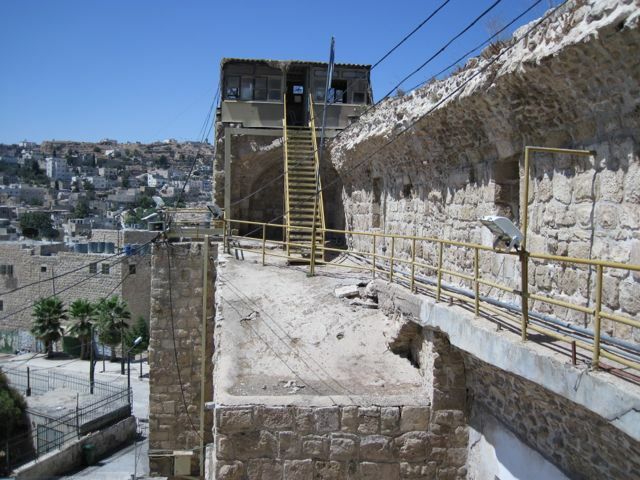 We had a lot of difficulty finding a tour that went to the Tomb of the Patriarchs/Cave of Machpelah in Hebron, deep inside of the West Bank. We also wanted to go to Bethlehem and that too is in the West Bank but it is relatively safe, as compared with Hebron which is pretty much in a war zone. What is the attraction of the Tomb of the Patriarchs in Hebron you might ask? 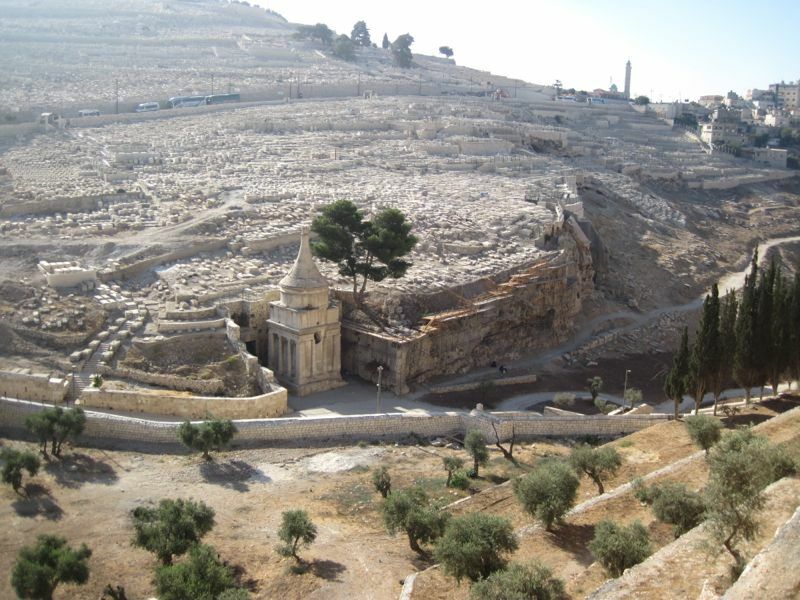 Well, it is the tomb of Abraham! Since we saw Abraham’s birthplace in Sanliurfa, Turkey we just had to see his tomb. 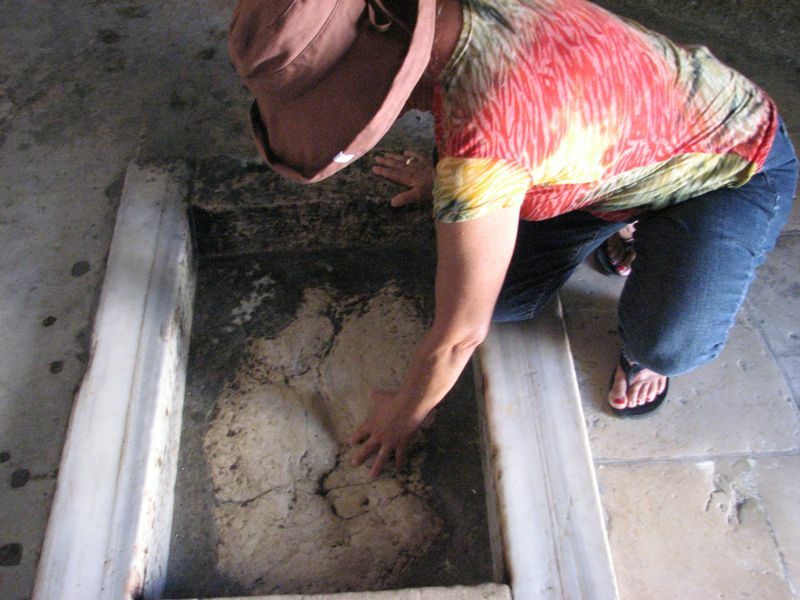 Also buried in the Tomb of the Patriarchs are supposedly Adam (The Adam! ), Isaac, Jacob and their wives: Rebecca, Leah and Sarah. 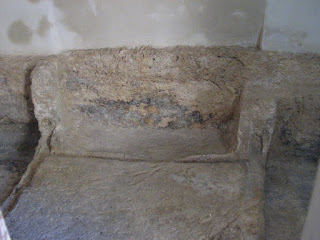 There is also the footprint of Adam in the Tomb. So who could resist going into Palestinian held territory to Hebron where there are bombings, shootings and general instability every day of the year? 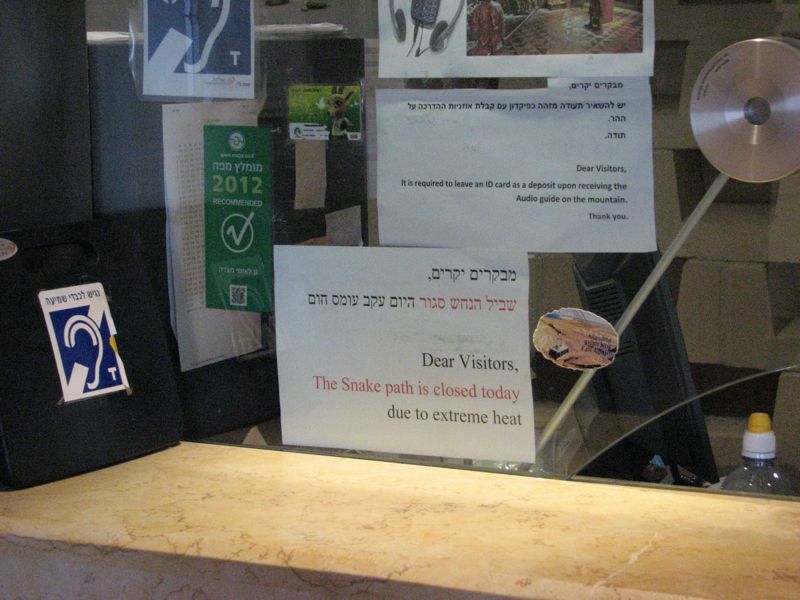 We asked our hotel in Jerusalem if they could find us a tour and after many calls to their friends they said No, it was not possible because of the situation. 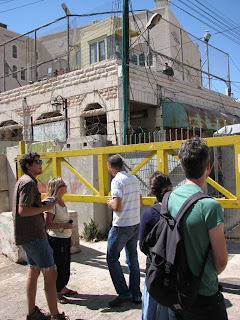 After much research we found Green Olive Tours, based in Bethlehem, and they offered a small tour that would take us to Hebron. Along the way we would have lunch with a Palestinian family, visit a refugee camp and then visit the Church of the Nativity once we made it safely back to Bethlehem. Our group of 7 were transported in a small Israeli bus to Bethlehem where we were left in the care of our Palestinian guide. We all piled into a small, unmarked, slightly beatup white van for the tour. Traveling on back roads we traversed zones A, B, C and then into X1. All of these zones are required because they have restrictions about who can be in which ones. Palestinians only in A; Israeli cars can go into B but cannot stay and so forth. X1 is the Israeli controlled part of Hebron and we had to go through 3 Israeli checkpoints to enter the Palestinian side of the Tomb of the Patriots. Yes, these are Israeli checkpoints because Israel controls most of Hebron but not all of it. To say that this is a lawless city is an understatement. 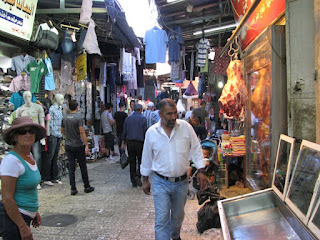 We walked through the mostly deserted small alleyways of the old city with only a few open shops scattered about. Why were all of the shops closed we asked our guide. Pointing up from the dark street we were standing on were plastic coverings and sometimes net coverings that were in place to prevent the bottles, rocks and every other item you can imagine including human urine from hitting those walking underneath. 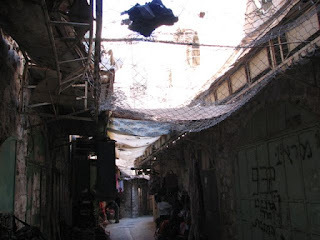 It seems that there are Jewish settlers who have taken residence in the buildings that extend above the Palestinian old city and these settlers make it extremely difficult for anyone working in the shops to do so. Essentially the Jewish settlers want the Palestinians out of Hebron and they are doing their best to make this happen. 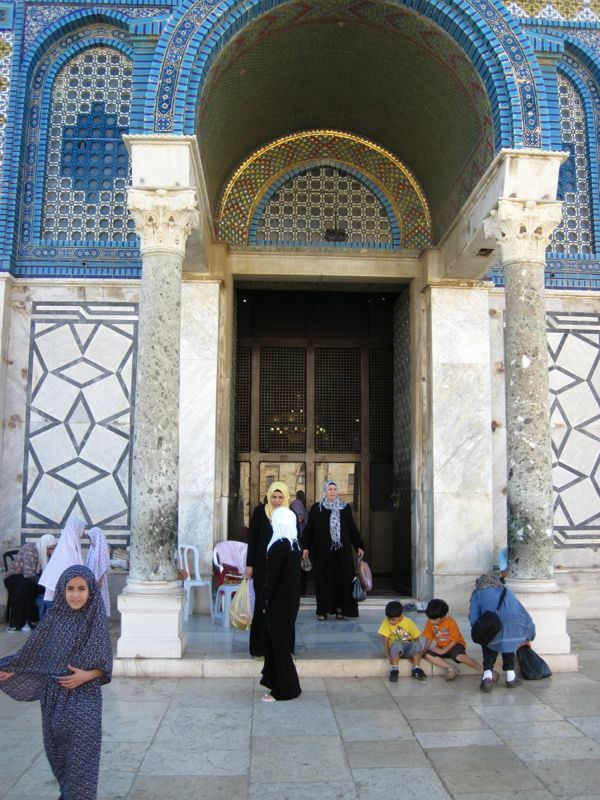 The Tomb of the Patriarchs is one of the most holy sites for both Jews and Palestinians. They both want this tomb for their own. As you can imagine this causes a lot of conflict! During the Israeli-Arab war in 1967, Israel captured half of the city and half of the tomb. So today the tomb is split into 2 parts, right down the middle. Abraham’s tomb is half inside the Jewish part and half inside the Palestinian part with iron gates and bullet-proof glass separating the two parts. Israeli troops control access to both sides of the tomb but the inside of the tomb is divided. This was really strange. 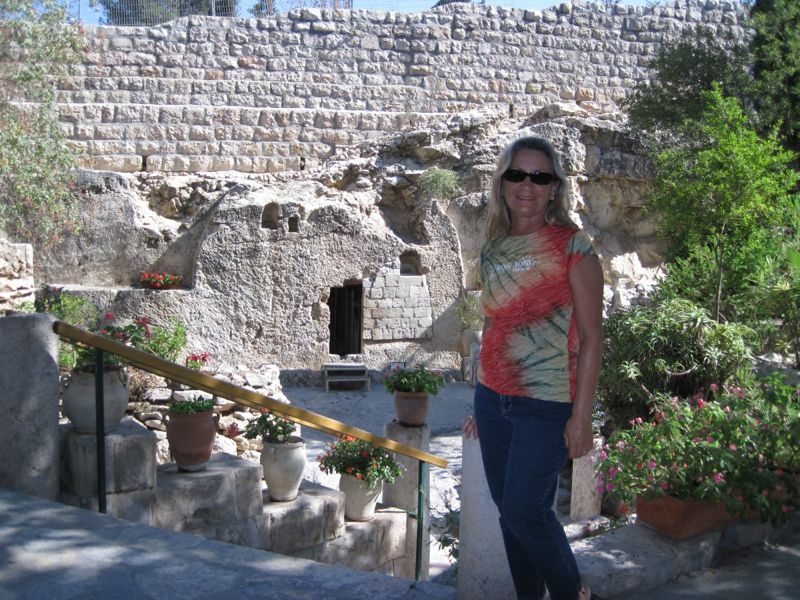 We were able to visit both sides of the tomb because we are Christians. 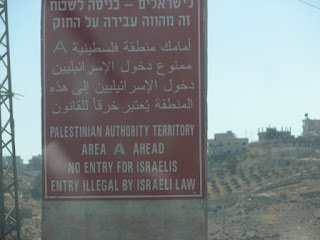 Our guide could not come with us to visit the Israeli side because he is Palestinian. 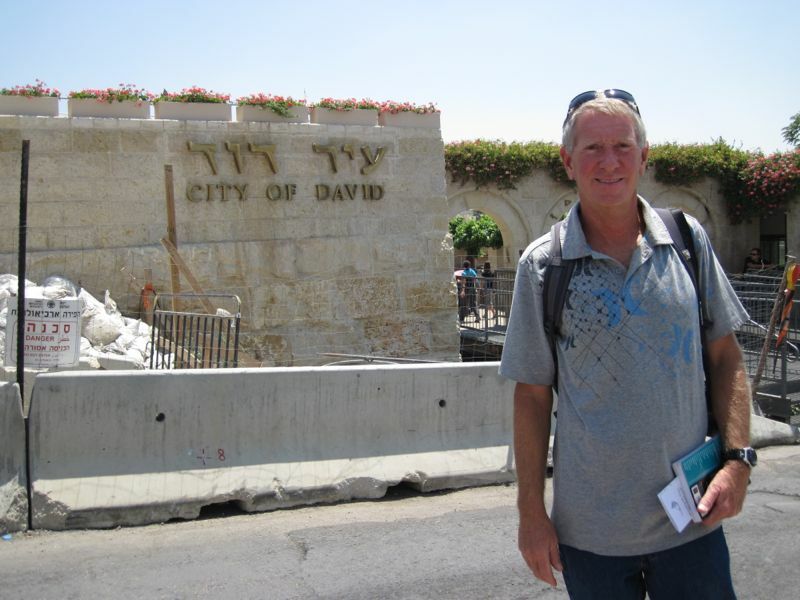 He told us to tell the military that we were Christians and nothing else when asked by the Israeli troops. A different answer would prevent us from visiting the tomb, either side of the tomb! So we passed through 3 Israeli checkpoints within 10 feet of each other on both sides of the tomb in order to visit the sacred site. 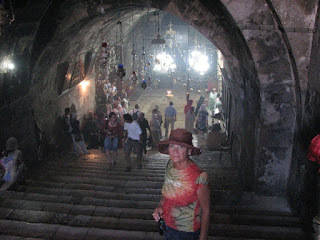 Maria had to wear the robe in the picture when we went into the Palestinian side of the tomb. 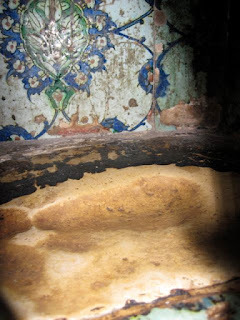 But we nearly did not get to go into the Muslim side of the tomb. It seems that even though the month long Ramadan is over they now had a 3-day holiday afterward and the tomb was closed for that. 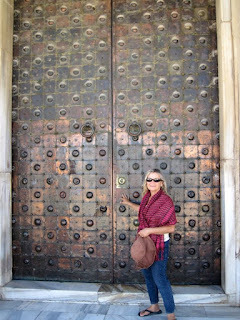 However our guide talked to the gatekeepers and we were allowed inside. Our guide was very good! After our visit to both sides of the tomb it was time for lunch with a Palestinian family who lives in a house right in the middle of the street that divides the Palestinian side from the Israeli side. There are no other houses or people allowed in this narrow strip of land except for this family. 10 yards away the heavily armed Israeli military kept constant watch on everything and everyone within 100 yards of the boundary. Our lunch was very nice with chicken and rice served upside down, a traditional Palestinian meal. We talked with the family and they told us their feelings of the current situation in the West Bank. It was fascinating to say the least. After lunch we quickly traversed the labyrinth of covered alleyways again before finding our van and driving to our next stop, a Palestinian refugee camp. The poverty inside the camp was oppressive to say the least. 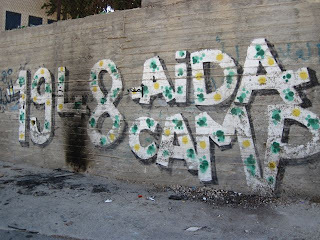 This camp was called the Aida Refugee Camp and it was built right next to the WALL that Israel is building throughout the West Bank. 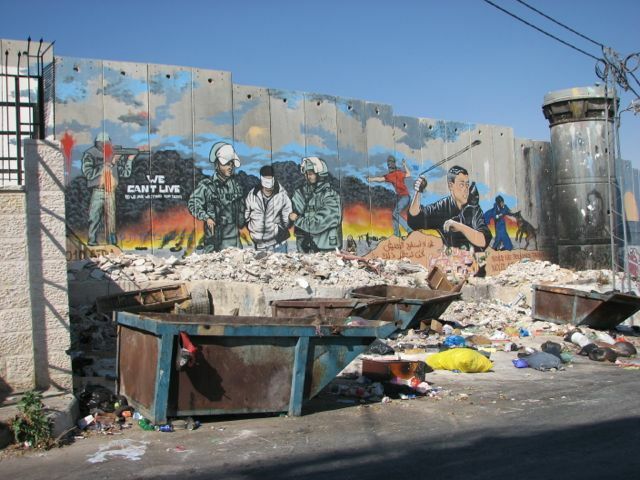 This wall is similar to the old Berlin Wall and is viewed as such by Israeli’s and Palestinians. Yet the wall grows bigger and longer and longer with each passing day. 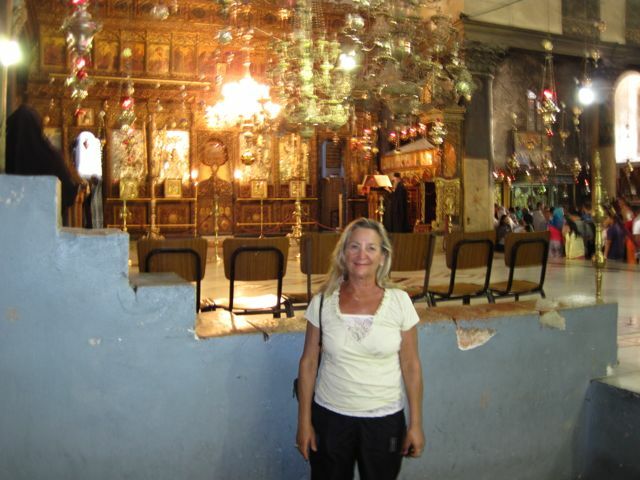 Next stop was Bethlehem and the Church of the Nativity where Jesus was born. Luckily it was not Christmas because the crowds were huge even now! A silver star in the church grotto marks the spot of Jesus’ birth. Right next to the star is the manger also in the grotto. It is difficult to describe how uplifting it was to be in this joyous place after the sights we had visited earlier in the day. We arrived back at our Jerusalem hotel after a very long day and basked in the coolness of our hotel air-conditioning, thinking, remembering and talking about the intense experiences we had this day. We wouldn’t trade this day for anything. We are preparing Aspen to sail the 4 days back to Turkey where we will leave her to rest as we return home to rest as well. The Dome of the Rock or Temple Mount, whichever you prefer. This is the where it all began. The rock beneath the dome is considered the foundation stone of the world - where Adam was formed by God. Sacrifices took place here, Abraham was here, Noah too and Solomon built the first temple here. 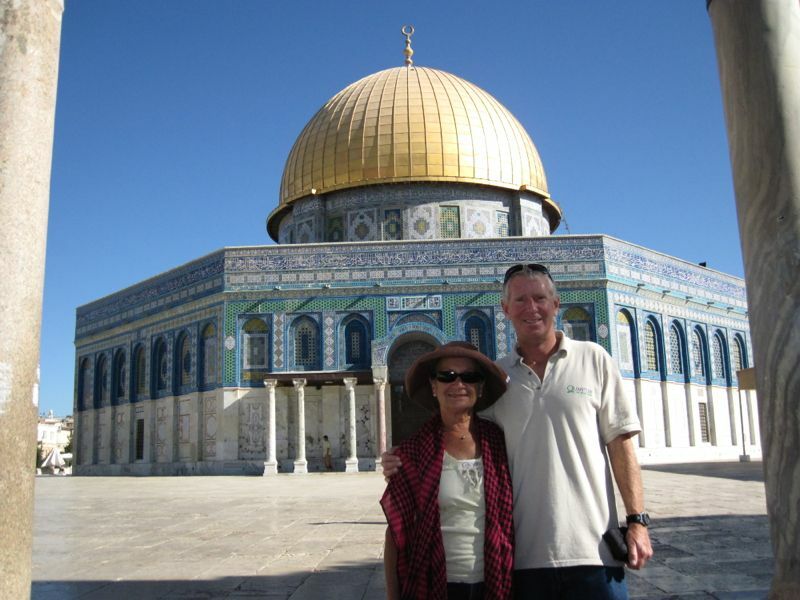 As you can see it is now a mosque where it is believed that Mohammad ascended to heaven. 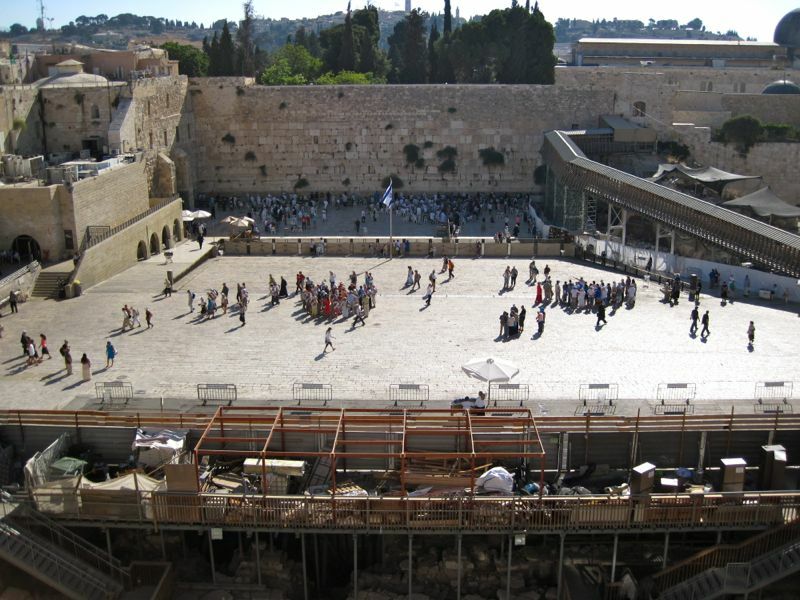 Jewish people cannot go near it because they think it is too sacred for them. 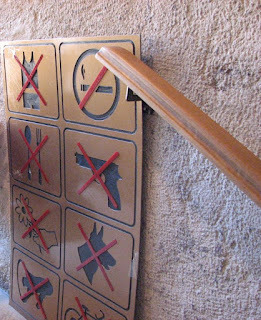 Christians are not allowed to set foot inside the mosque because the Muslims won't let them. 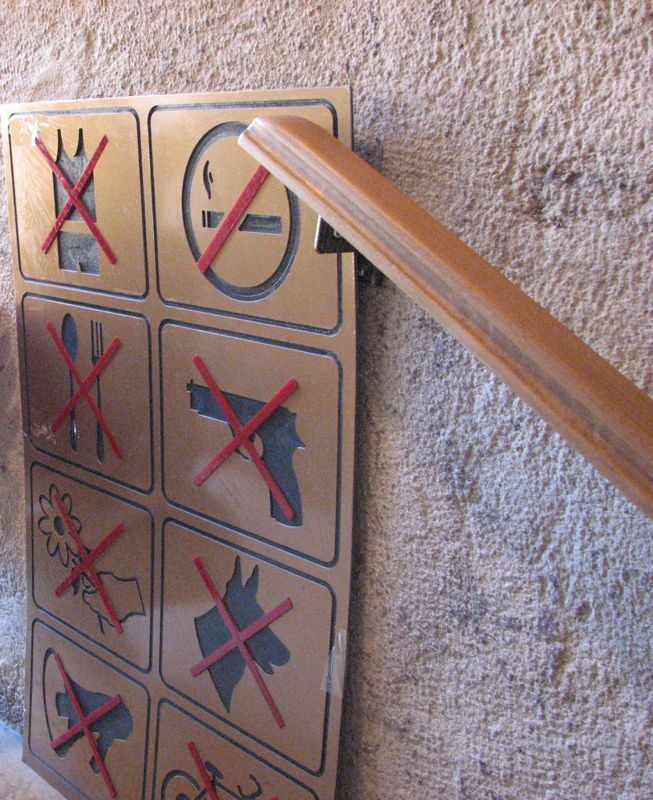 Only Muslims can pray anywhere near here and inside the mosque but if anyone else tries to pray or bring a religions object near the mosque they will be instantly ejected by security. The Dome of the Rock is in the Old City of Jerusalem and considered the most sacred place for Jews and Muslims. 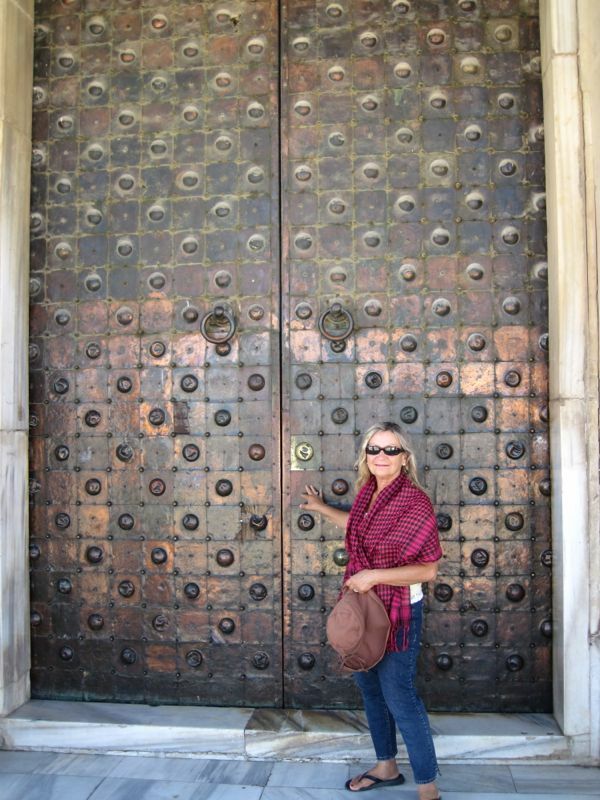 Maria touching the locked door at the Dome of the Rock. 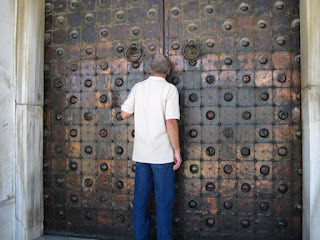 Captain Steve looking through a crack in the door to see the actual rock in the center of the mosque. A few Muslim women had a talk with Steve right after this picture was taken. The tomb of the Virgin Mary is in the grotto. The air was filled with smoke from a Greek Orthodox mass was going on at the time as you can see from all the smoke. 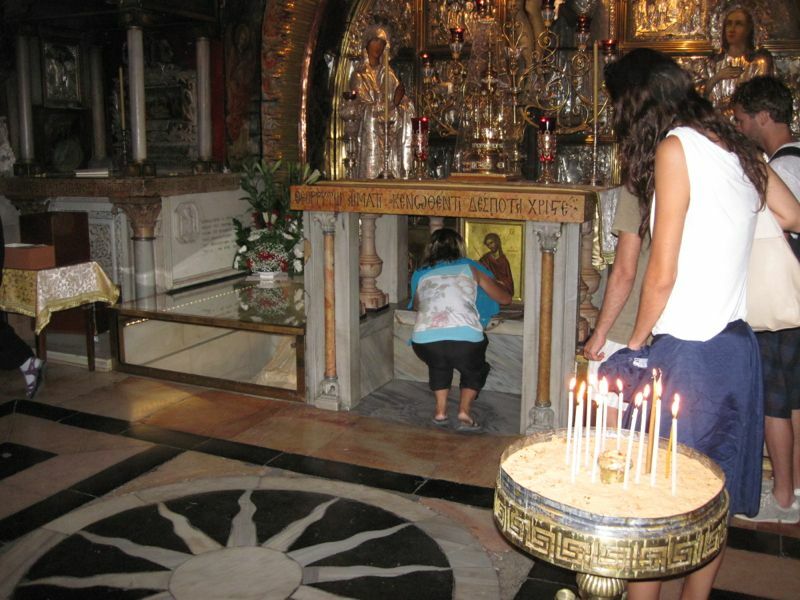 This is the Greek Orthodox mass taking place in the tomb of the Virgin Mary. The priest in the black robe was impressive looking! 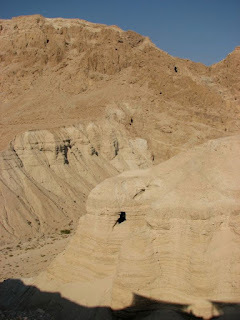 The cave in the desert where the Dead Sea Scrolls were found. they were hidden for nearly 2,000 years before being found and preserved. 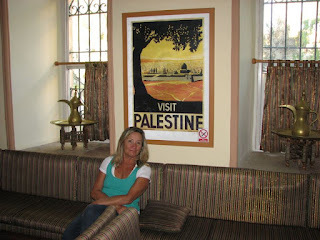 The eastern part of Jerusalem is in Palestine territory as you can see from the poster in our hotel. 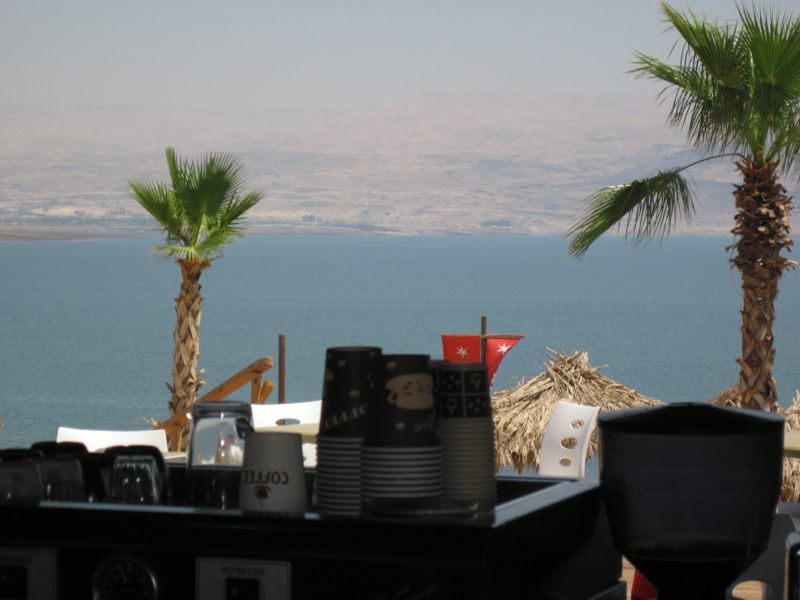 We didn't know that when we reserved the hotel but it was in a great location near the old city. Damascus Gate with all of the vendors waiting to greet us every day. 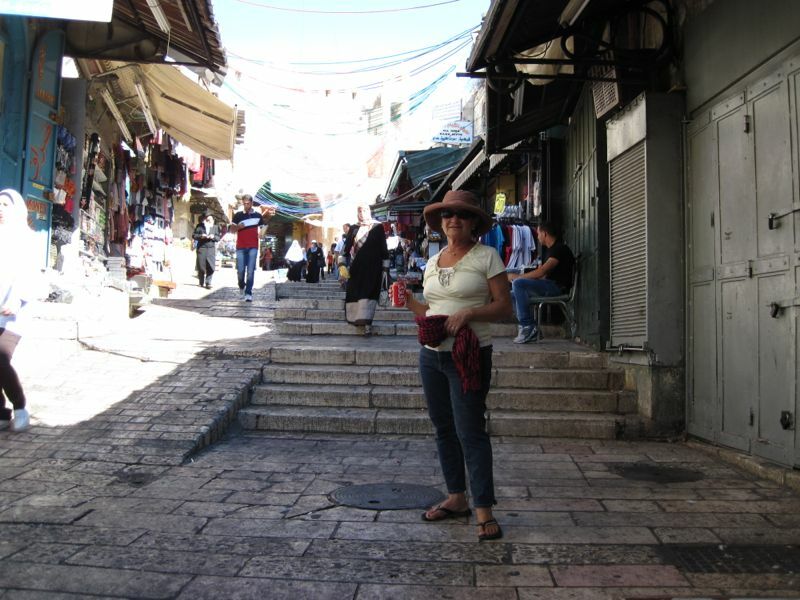 Maria has the light blue colored top on as she makes her way to the Western Wall (Wailing Wall). 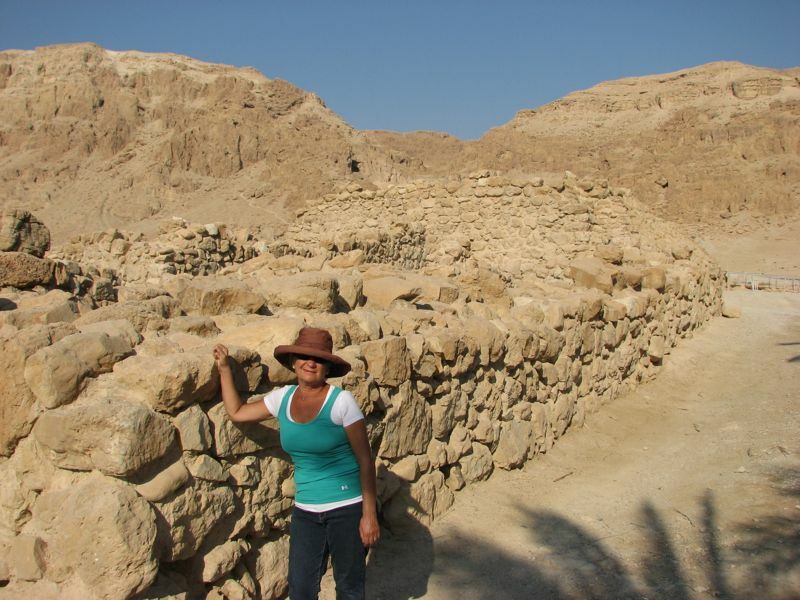 This is the woman's side of the wall that is separated from the men's side by another wall. The woman's side is much smaller than the men's side for some strange reason. 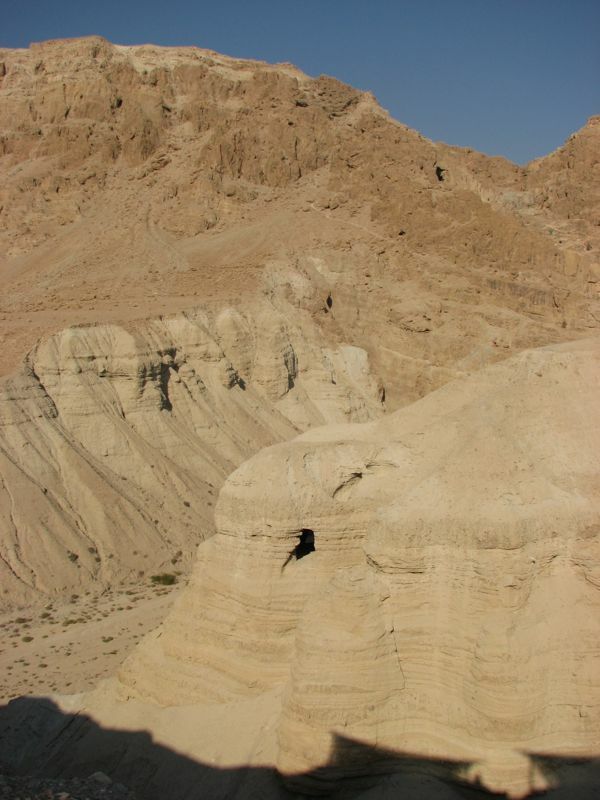 The Dead Sea scrolls were written by a religious sect who occupied this area in the desert. The temperature was well over 100 degrees at 8:00 am! Masada! 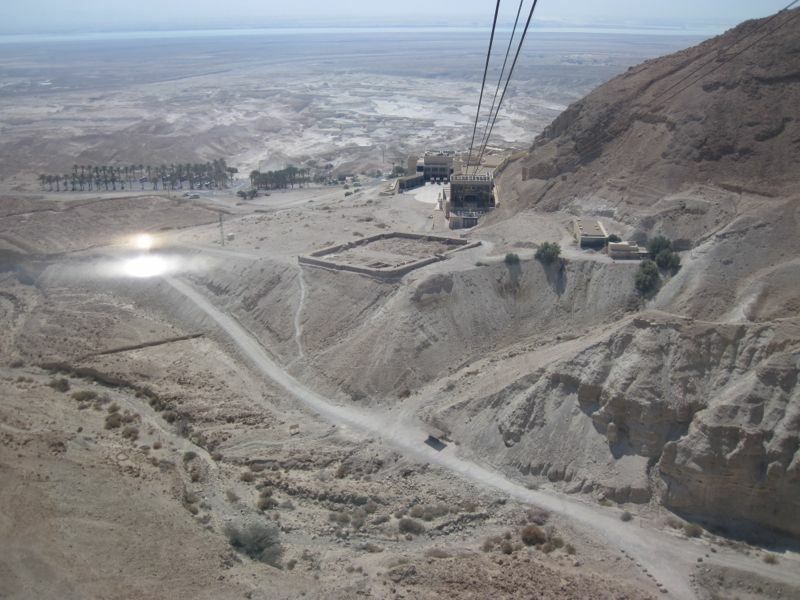 There is a cable car that takes tourists to the top of Masada. 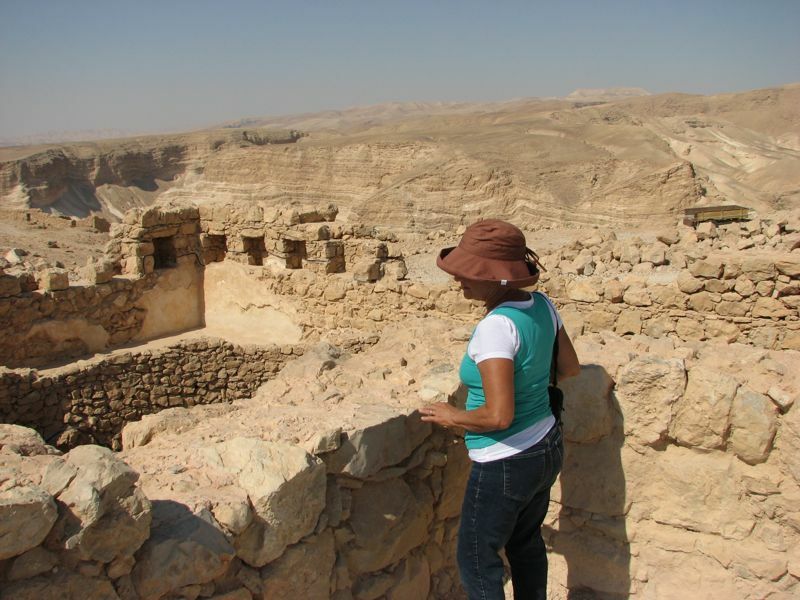 Masada was the last battle site for the Jews before being defeated by the Romans. Instead of being captured, the 960 men, women and children committed mass suicide immediately before the final battle when the Romans finally breached the defensive wall. These Jews preferred death as opposed to slavery at the hands of the Romans. 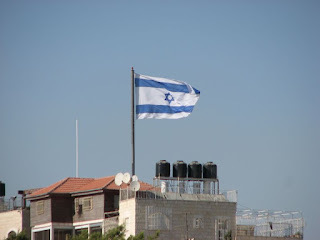 This site is revered by the Jewish population today. 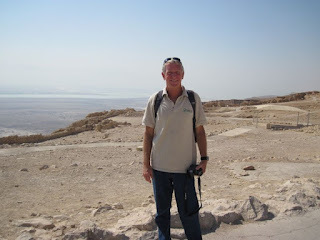 The top of Masada in the extreme heat! Some of the old fortifications atop Masada. The cable car route down from Masada with the Dead Sea in the distance. 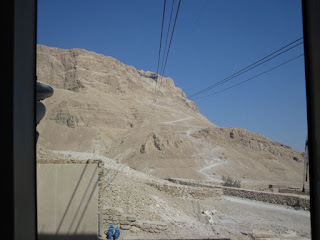 The warning sign stating that it was too dangerous to run down from the top of Masada to the base. Captain Steve must have missed the sign? It was a long way down the Snake Trail in the extreme heat! Mud bath in the Dead Sea. Even Maria floated and paddled around before getting coated in the invigorating mud! Captain Steve needed to cool off after running down the Snake Trail. The Dead Sea mud was a bonus! 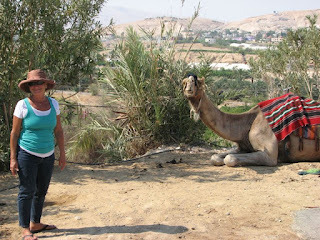 Maria and the Camel. They both have nice smiles! 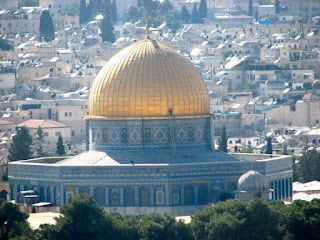 The Dome of the Rock (Temple Mount) in Jerusalem. Probably the most photographed place on Earth, or so they say. 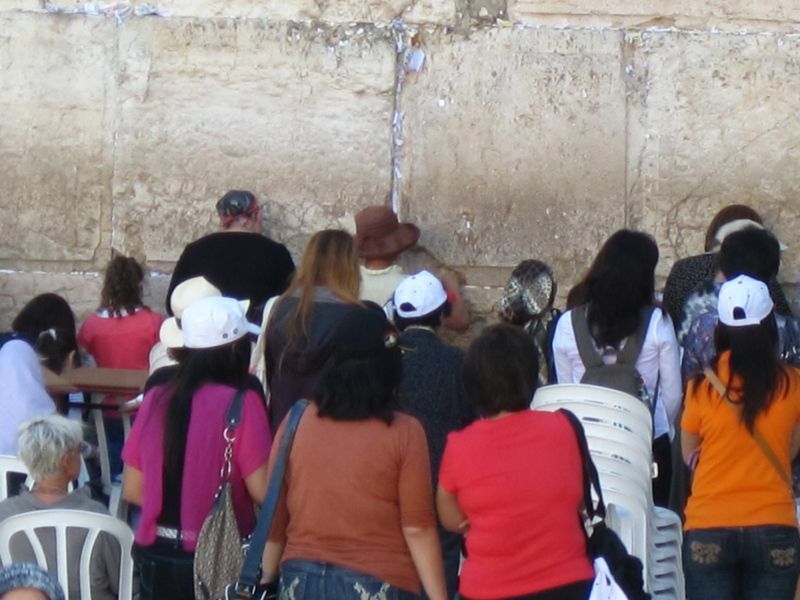 As is the time honored tradition, Maria stuffs her note into the Western Wall. 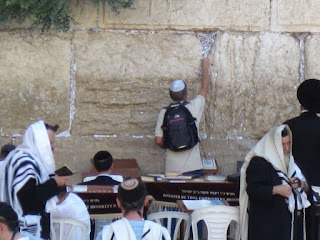 Captain Steve putting the required yamaka on before approaching the Western Wall. 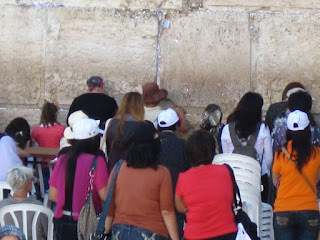 Captain Steve being closely watched by the person in the black hat as he stuffs his note into the Western Wall. Yes, we are in Israel! The Western Wall (Wailing Wall). The women's side is on the right and the men's side is on the left. The main entrance to the Dome on the Rock (Temple Mount). No, we can't go in there! Another street in the Old City. As you can see, it is not handicapped accessible! Solomon's quarry that was dug beneath the old city. 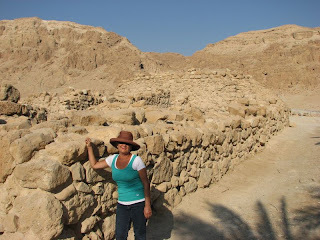 This is where all of the building material came from to build the temples, churches and buildings in the old city. These tunnels go everywhere beneath the city and they hold secrets that have not been uncovered as yet. Most of the tunnels have been sealed off for over 2,000 years so who knows what may lie beneath the city? 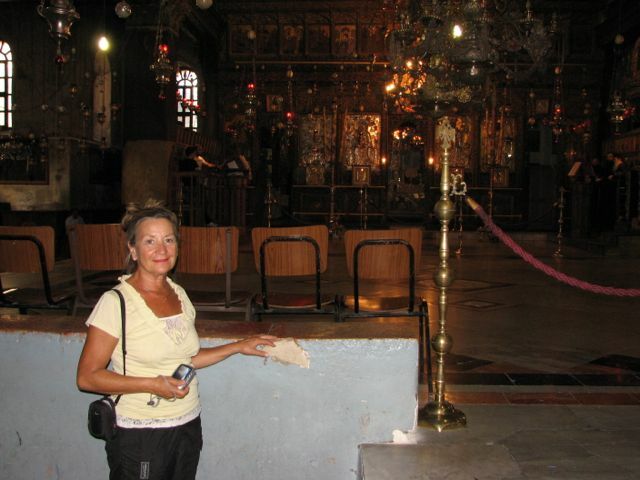 The site of the crucifixion with Maria at the spot. 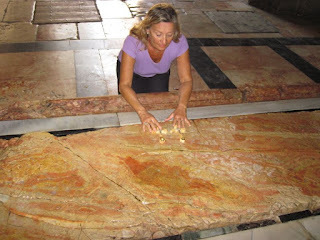 Maria placing her crosses on the anointing rock where Jesus was laid after he was crucified and anointed with oil. 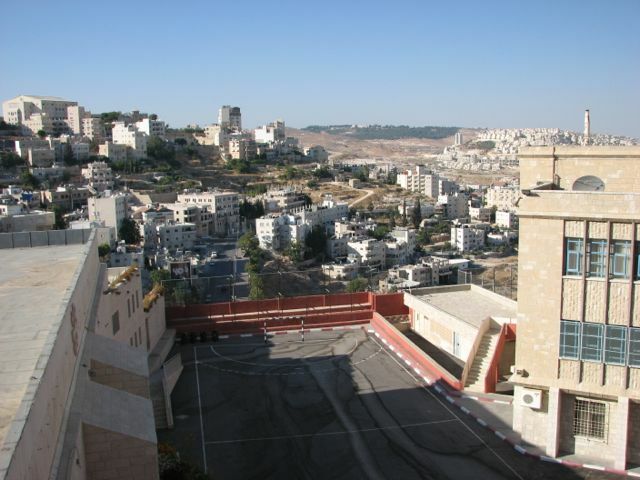 The ancient City of David and the thousands of tombs waiting for the judgement day. 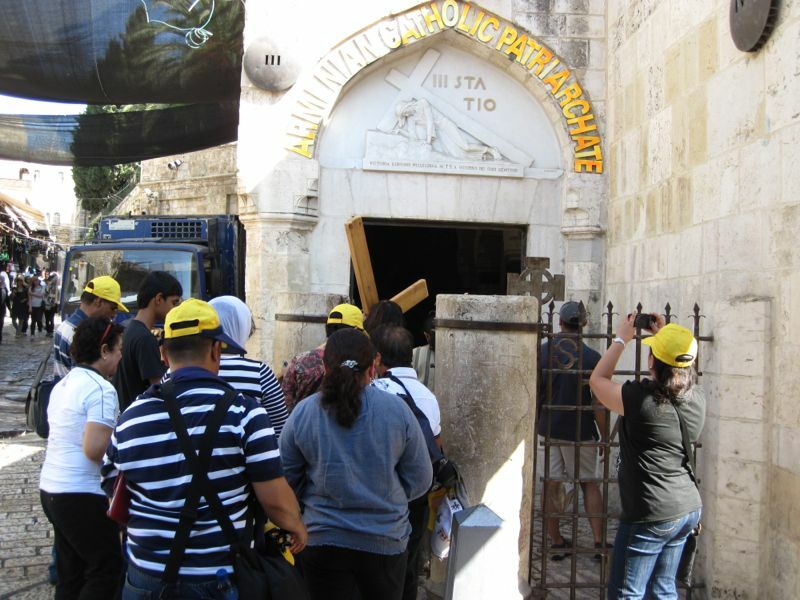 The third Station of the Cross with a group carrying a replica cross in their travels around the old city. Many groups do this which causes even more confusion in the Old City. 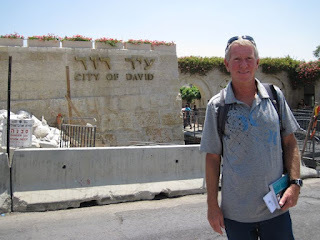 At the city of David! 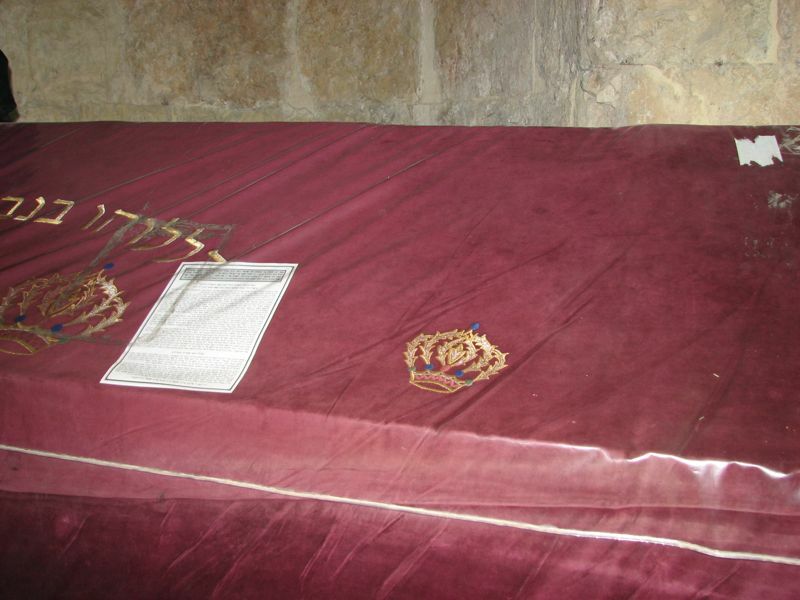 Kind David's Tomb in Jerusalem. David was the first king of Israel and highly revered. The tree marks the place of the Last Supper in Jerusalem. This site is another very sacred place. This is Zion Gate, another entrance into the Old City. The holes in the rocks are bullet holes from the Israeli troops attacking through here to gain entrance to the Old City in 1948. Besides the bullet holes the Israeli troops tried to blow up a section of the Ottoman wall but of course that failed. The walls are impenetrable! The fighting outside this gate was described as fierce. 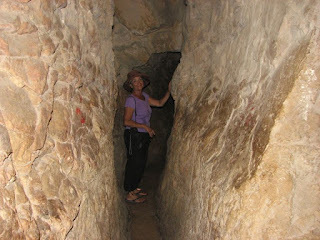 Hezekiah's tunnel that we had to squeeze through. This mystical tunnel is thought to have carried water to the City of David but others don't believe that story and think it actually runs under the Old City to provide access to something hidden there. The Garden Tomb. 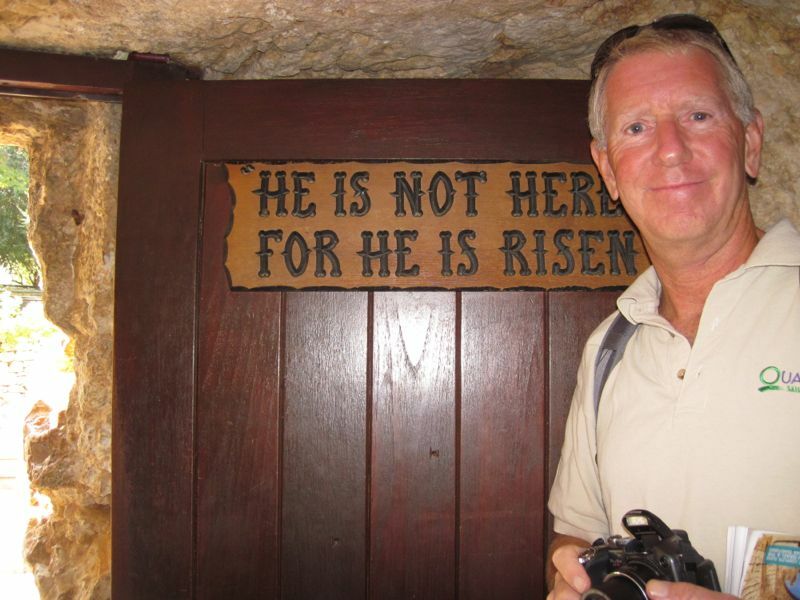 This is another place that some think is where Jesus may have been buried. We wanted to make sure we had both possibilities covered so we came here too. 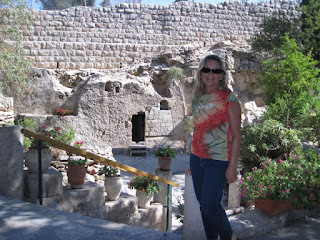 This is the door to the Garden Tomb, right around the corner from our hotel. There is a beautiful garden outside the cave that is away from the noise and confusion of Jerusalem. 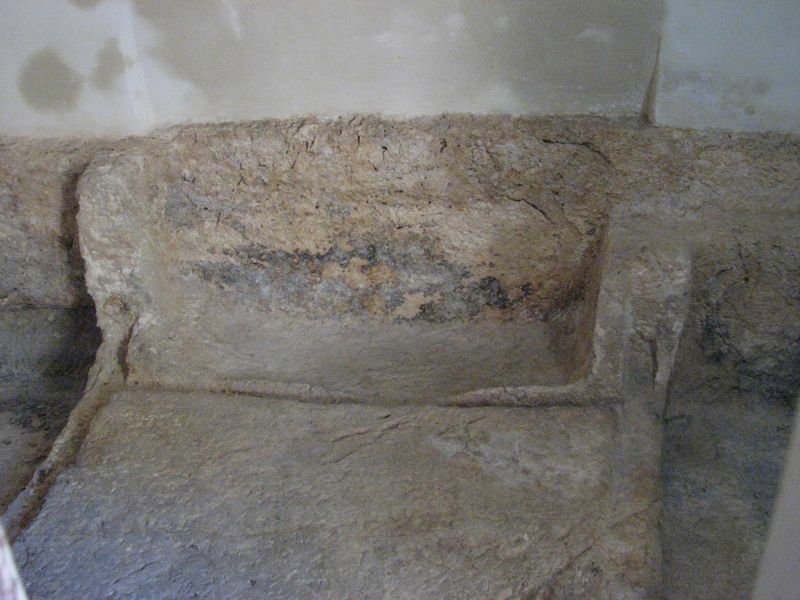 The inside of the Garden Tomb. The stench of urine hung like a shroud in the stifling August heat as we stood before the massive Gate of Damascus, the entrance into Jerusalem’s Old City, the holiest city on Earth for all Christians and Jews. 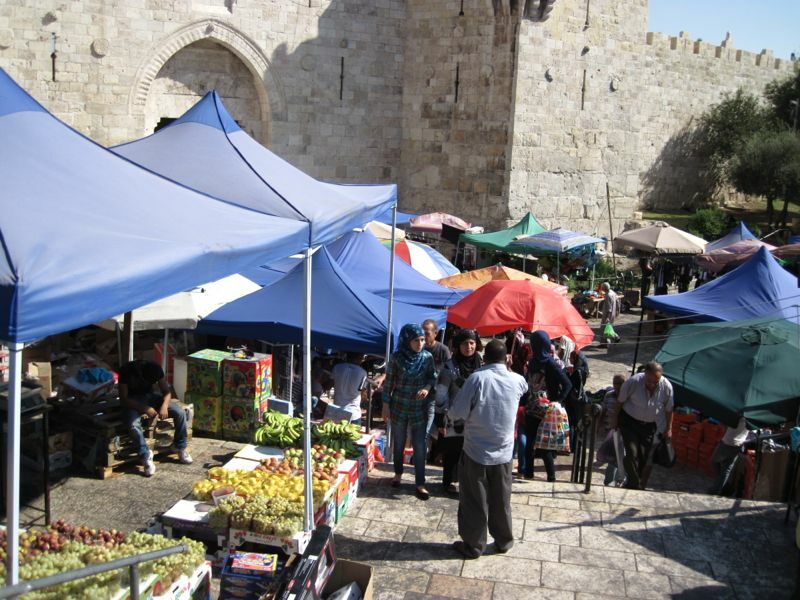 Muslim merchants shouted and entertained everyone with their antics as we tried to squeeze past their many overflowing souvenir and food carts nearly blocking the entrance into the city. Throngs of people surged into and out of the city through this gate from sunrise to sunset and beyond every day of the year. Struggling to find a clear pathway into the city we finally stood inside the massive Ottoman limestone walls, face to face with the ancient holy past. Behold, and what did we see? Piles and piles of trash lining the narrow pathways that snaked in all directions past the myriad of Christian churches, Greek Orthodox churches, Armenian churches, Russian Orthodox churches, Synagogues and Mosques. They need more street sweepers in this place! Before us, on the side of a hand hewed church wall was a chiseled Roman numeral, faded by the ravages of time. This was a station of the cross where Jesus actually walked. We were now walking in the footsteps of Jesus! Chills ran down my spine, as I finally comprehended that we were walking in the exact footsteps and path that Jesus walked over 2,000 years ago. 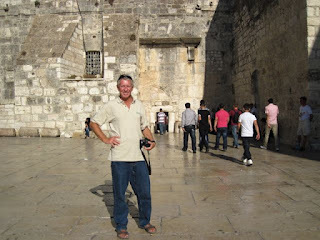 This was why we had sailed so far - to see the Old City of Jerusalem. Maria and I began our own pilgrimage at the first Station of the Cross, where Jesus was condemned to death by Pontius Pilate, and followed the path to every subsequent Station until we found ourselves facing the entrance to the Church of the Holy Sepulchre, looking for station number 10. 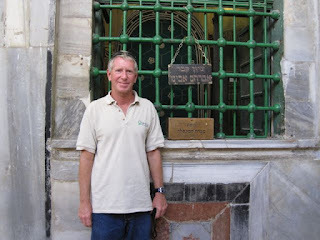 Heathen Steve took a deep breath and entered through the massive wooden doors that guard the entrance to the Church of the Holy Sepulchre. Inside the doors we found peace. Peace from the yelling throngs of Muslim merchants selling their wares, peace from the wandering crowds among the pathways throughout the old city, peace from the stench and mounds of trash strewn about the pathways and peace that comes from reverence for the holiest place on Earth for Christians. 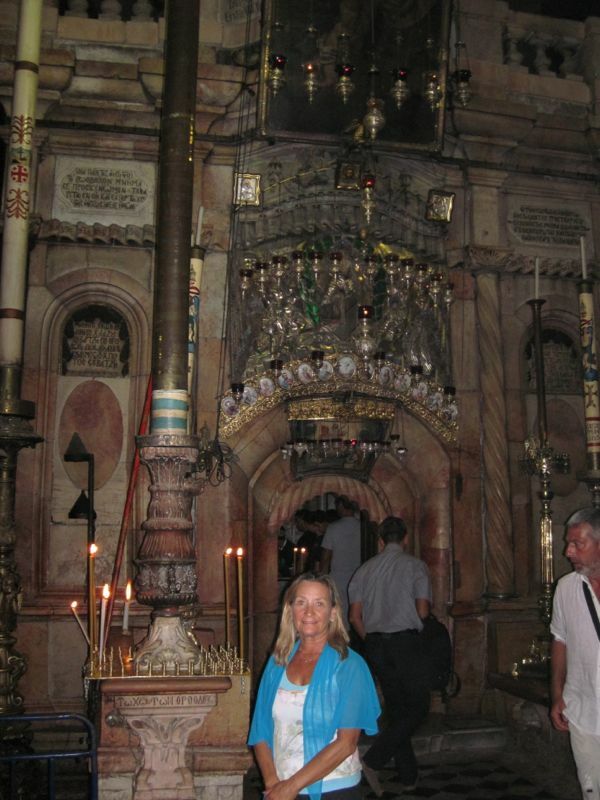 We found stations 10, 11, and then station 12, the exact place where Jesus was crucified and died upon the cross. Calvary, the site of the crucifixion. There was a heavy silence from those who were gathered there, some kneeling in prayer, others with heads bowed and everyone with a profound sense of sorrow. With heavy hearts we continued our search for station 13 and finally the last station, Station 14 – the place where Jesus was laid to rest in the cave. Deep inside the ramparts of the Church of the Holy Sepulchre and in the exact center of the Church is the rock, the remains of the tomb, where Jesus was placed after his crucifixion. 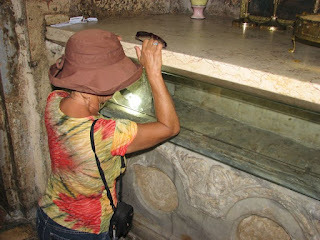 Touching the rock is a centuries old tradition among pilgrims to the holy land and we were no exception. The line to get into the grotto was long but worth the endless wait as we squeezed inside and laid our hands upon the rock. 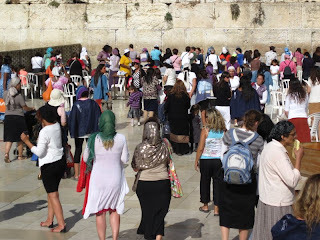 We were kneeling at the holiest place on Earth for Christians. A Catholic mass had just ended with the priest doing exactly what we were doing, touching the rock as billows of smoke from burning incense swirled around his head. The moment was truly mystical and magical, all at the same time. The priest who guarded the grotto softly urged us to leave so that others may enter in our place. Our visit to the grotto and the Church of the Holy Sepulchre seemed to have ended so quickly but will remain in our hearts forever.